Now in its second-generation, the Kia Cerato KOUP is one of two small coupes that the Korean brand is offering in Australia. The little black two-door Kia Cerato KOUP Turbo was supplied with automatic transmission, a good choice for this little go getter. 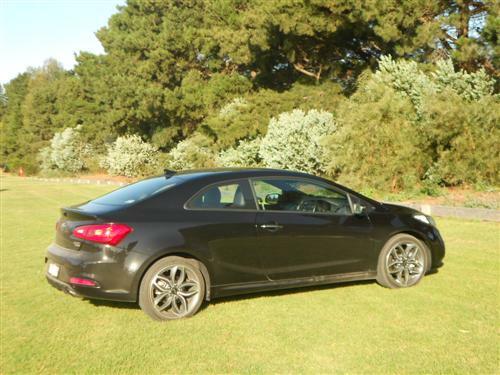 The Cerato KOUP Turbo automatic is priced from $30,290*. With premium paint, such as Aurora Black as per the test car, the price* as tested came in at $30,810*. Cerato KOUP Si comes with a 2.0-litre non-turbocharged petrol engine and the Cerato KOUP Turbo (as tested) comes with a 1.6-litre turbocharged engine. Both models have a choice between a manual or automatic transmission. Prices commence at $23,990* for the Cerato KOUP Si 2-litre manual coupe. Automatic adds $2,300* and premium paint is $520*. The KOUP Turbo manual is priced from $27,990*. The little KOUP Turbo gets along quite well for its price segment. There should be no disappoint in that respect. The ride is pleasing too and the KOUP proves how Kia has managed to improve the driveability of their popular small cars. 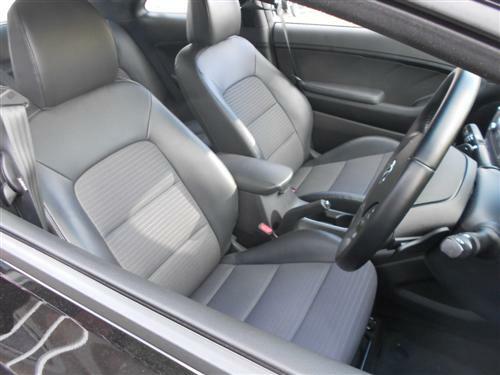 The comfort level was pleasing too and the car is amazingly quiet for a small economy-conscious car. All the controls are intuitive and well positioned for convenient use. The test car had the desirable 1,591cc turbo-charged four cylinder engine fitted. This engine develops 150kW of power @ 6,000rpm and maximum torque is 265Nm @ 1,750-4,500rpm. A 2.0-litre non-turbo engine is on offer, too. Both engines are offered with a six-speed manual and a six-speed automatic transmission. 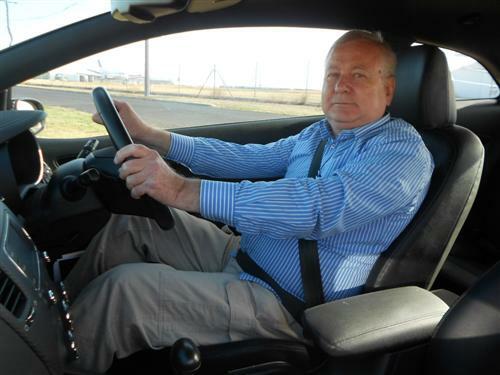 The test car came with auto which was quite suited to the well-performing car. Disc brakes are at each wheel - ventilated at the front, solid at the rear. Eighteen-inch alloy wheels come with the KOUP Turbo. Suspension is a simple lay-out - McPherson struts up the front and Coupled torsion beam axle for the rear. During our 314 kilometres with the Cerato KOUP Turbo we managed 9.9 litres per 100 kilometres, according to the on-board trip computer. Our driving was solely in an urban environment, which included some 80 km/h highway motoring. Factory specs indicate the fuel consumption rating is 8.0 litres per 100 kms for the 'combined cycle'. The 'urban cycle' is rated at 11.3 litres per 100 kms and the 'extra urban cycle' is 6.0 litres per 100 kms. Non-turbo 2-litre Cerato KOUPs use a little less fuel. 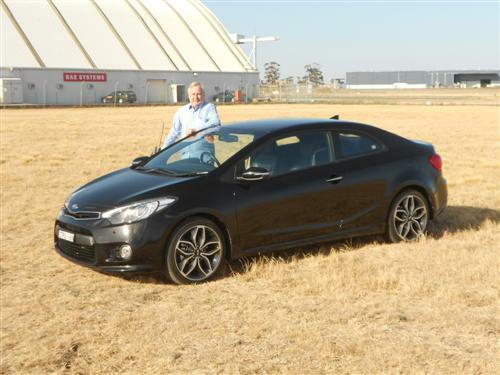 The Cerato KOUP turbo runs on regular unleaded petrol. The fuel tank capacity is 50 litres. Standard: MP3 compatible CD player with AM/FM tuner; My Music function (MP3 copy function from USB/MP3 CD); 4.3" full touch colour LCD screen; AUX/USB input with iPod compatibility (on selected iPod models); Bluetooth functionality (phone/media stream) for compatible devices; Steering wheel mounted audio/Bluetooth controls makes the Cerato KOUP Turbo easy to keep up with modern day devices. Standard: Anti-lock Braking System (ABS) with Electronic Brakeforce Distribution & Brake Assist; Electronic Stability Control with Traction Control System; Vehicle Stability Management); Front Corner and Reverse parking sensors with Parking sensor dash display; Rear view camera with in-audio screen display & parking guidelines amongst a list of typical safety related items. There is also Speed sensing auto door lock; Child restraint anchorage points (3 anchors + 2 ISOFIX positions); 3-point seatbelts at each of the five seating positions. Importantly, six airbags are included. ANCAP rate the Cerato KOUP with five stars for crash worthiness with a score of 35.51 out of a possible 37. An excellent support package is available. The Cerato comes with a five year/unlimited kilometre warranty, roadside assistance for one year (extendable if a Kia dealer maintains the car with scheduled servicing) and capped price servicing. Conditions apply to each of these components, of course. 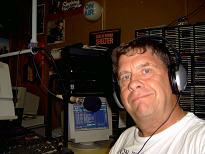 Kia Motors is making some great products. The Cerato KOUP Turbo is one of them. This new model features a sportier silhouette than the first generation model but it retains the interior comfort and space. 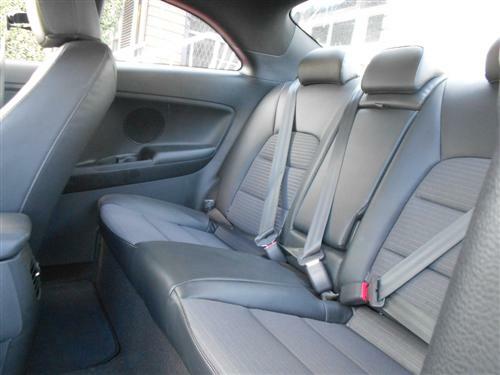 Not too many small two-door cars have reasonable rear seat accommodation. Yet, this new Cerato KOUP manages quite well. The real treat is in driving the little turbo coupe. I like the way it feels on the road and it may well give you a 'boost' too. For its price, this small car offers a considerable amount of enthusiasm and spaciousness. 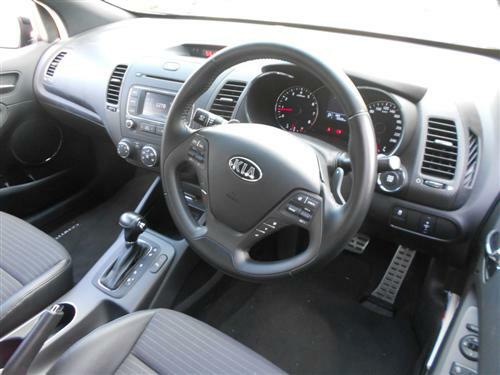 I like the Kia Cerato KOUP Turbo - it is exceptional value and a good drive be it commuting, errand running or cruising.